Beat cream cheese and sour cream together til smooth, add taco seasoning. Spread on large glass dish…top with lettuce, Green onion (if you like onion) Tomatoes and black olives sliced. Top with cheddar cheese…use any corn chips you desire. Best part of this is you can add more or less toppings to the base depending on tastes and kids love it too. 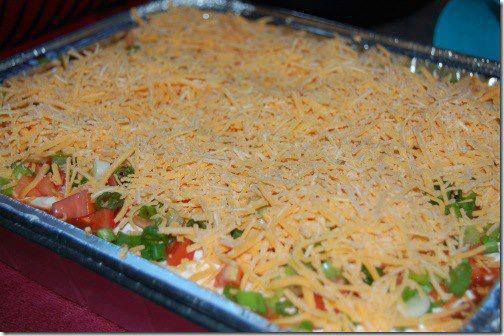 I recommend using disposable 9×13 aluminum pan if taking this dish to a party or picnic. It can be split into 2 round cake pans if you have picky eaters too!